Ivory & Black Soho proudly presents “Heritage”, a new exhibition by Pedro Matos, which embodies the artist’s much anticipated first solo exhibition in London. “Heritage” features a new series of oil paintings on canvas and one site-specific installation. The exhibition will also comprise of the release of a limited edition artist’s book of Pedro Matos’ work and life. 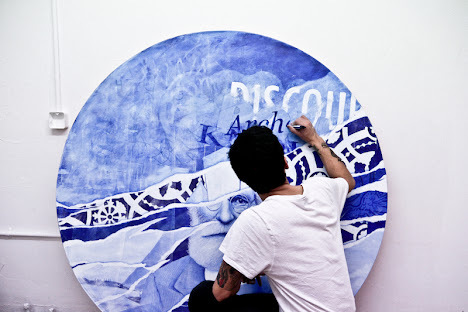 Pedro Matos is an Artist and Curator born in Santarém, Portugal in 1989. Influenced by the sub-cultures of Graffiti and Skateboarding he was immersed in, Pedro started painting at the age of 16 in Lisbon where he attended studies at both the Faculty of Fine Art – University of Lisbon, Ar.Co Art Centre , and later decided not to complete his academic education. After completing a painting course at Central Saint Martins, Pedro went on to pursue his career in London, where he currently lives and works. His work has been exhibited at numerous galleries and museums across the world, such as the University of Arizona’s Museum of Modern Art, Philips de Pury in London, White Walls gallery in San Francisco and Thinkspace Gallery in Los Angeles. Pedro Matos also works as a curator and was responsible for shows in Lisbon, London, Atlanta and Miami, having also recently co-founded Ivory&Black Soho in London.